The University of Chile is the largest and oldest institution of higher education in Chile and one of the oldest in Latin America. The University of Duisburg-Essen is a public university in Germany and a member of the University Alliance Metropolis Ruhr. Here it is the second newsletter of the PRASEDEC project: “Management of Disasters Seminar, TUL – Industry and Smart Security Workshops”. Click the image to see it full size. You can download the pdf file here. Here it is the first newsletter of the PRASEDEC project: “Kick-off”. Click the image to see it full size. You can download the pdf file here. 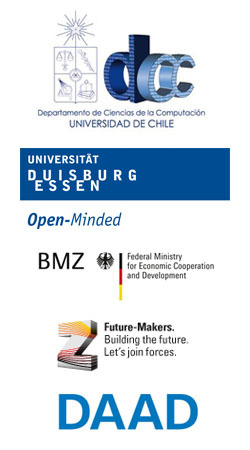 Practice-driven Advance of Studies and Exchange between the Universities of Duisburg-Essen and Chile. ↑ © Copyright 2013 PRASEDEC. All Rights Reserved.